Happy Valentine’s Day! This post has a multipurpose. First, it’s a nice way to celebrate the holiday. 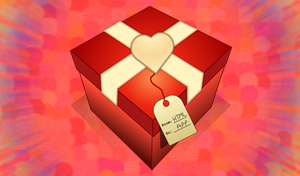 I didn’t plan to announce the “Wrapping” app on Valentine’s Day. It just turned out that way. But since the app icon has a nice heart on top, I figured that I could combine the two events. The plan to launch the app about a week ago. Needless to say, it’s been a rough week. That leads to the theme of this post. Does Apple truly love developers?